The first Ariane launcher blasted into the sky on Christmas Eve, 1979. An early Christmas present for the thousands of workers throughout Europe and at Europe’s spaceport in Kourou who were involved in its development and production. Ariane 1 was designed primarily to put two telecommunications satellites at a time into orbit, thus reducing costs. 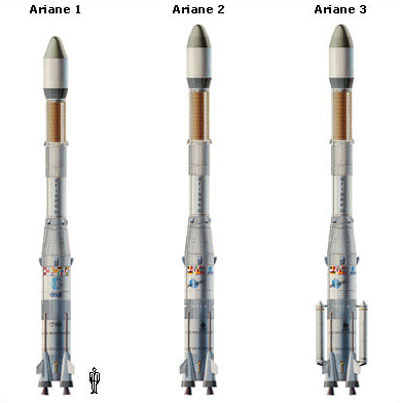 As the size of the satellites grew Ariane 1 began to give way to the more powerful Ariane-2 and Ariane-3 launchers. Altogether, eleven successful Ariane-1 launches took place between 1979 and 1986, and five successful Ariane-2 flights between 1987 and 1989. Ariane 3 made a record 11 flights from 1984 to 1989, all of which were successful. All three launchers were slightly different. The first and third stages of Ariane 2 and Ariane 3 were longer than those of Ariane 1, while Ariane 3 had strap-on boosters containing liquid or solid propellant, making it the most flexible and powerful of the three launchers, able to launch a payload of 1.7 tonnes.